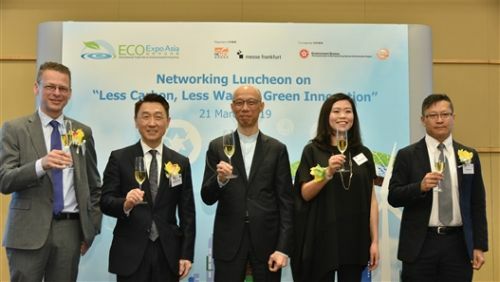 HONG KONG, Mar, 29 2019 - (ACN Newswire) - Embracing the new theme of "Less Carbon, Less Waste, Green Innovation", the 14th Eco Expo Asia will showcase a wide range of environmental products and solutions from Hong Kong, Mainland China, Asia and the global green tech community. The expo, running from 30 October to 2 November 2019 at AsiaWorld-Expo in Hong Kong, is jointly organised by the Hong Kong Trade Development Council (HKTDC) and Messe Frankfurt (HK) Ltd, and co-organised by the Environment Bureau of the Hong Kong Special Administrative Region (HKSAR) Government. Addressing guests at the luncheon, Wong Kam-sing, Secretary for the Environment of the Hong Kong Administrative Region (HKSAR), elaborated on how various government initiatives are helping to address the issues raised in the theme of this year's Eco Expo Asia. "For 'Less Carbon', we encourage the application of more clean energy including renewable energy. We introduced the Feed-in Tariff (FiT) scheme last October to support the generation of renewable energy. We support the industry to enhance energy efficiency in buildings by offering incentives such as tax reductions. We also support more green mobility in the city," he said. For "Less Waste", the Government has put a lot of effort into the development of waste management infrastructure projects in recent years. For instance, WEEE PARK, the Government's Waste Electrical and Electronic Equipment Treatment and Recycling Facility, has adopted advanced technology to turn waste electrical and electronic equipment into usable resources while O PARK, Hong Kong's first organic resources recovery centre, converts food waste into energy. The Government will build the second O PARK soon and plans to have more relevant facilities to face the challenge of Hong Kong's food waste. Mr Wong said the Government is also looking into several new initiatives that can improve waste management. "We have submitted the Waste Disposal (Charging for Municipal Solid Waste) (Amendment) Bill 2018 to the Legislative Council. We are going to review the plastic shopping bag charging level and exempted items. We are also applying reverse vending machine that can help to collect and recycle plastic beverage bottles. In addition, after the super typhoons in recent years, we are working on a new scheme to see how to make the best use of yard waste." Regarding "Green Innovation", Mr Wong highlighted two key initiatives, namely the E&M InnoPortal and Retro-commissioning. "Launched by the Electrical and Mechanical Services Department (EMSD) in 2018, the E&M InnoPortal helps start-ups to find venues for trial applications of their new projects. For instance, the EMSD headquarters building has been designated as a venue for start-ups to test their energy efficiency devices and to collect real data for scaling up their applications. Meanwhile, Retro-commissioning helps to improve energy efficiency for existing buildings," Mr Wong elaborated. The Startup Zone returns in 2019 as one of the highlights of Eco Expo Asia. "Start-ups from around the globe can leverage this opportunity to showcase their latest innovative products and solutions and to meet with potential buyers, manufacturers and investors," Mr Chau said. Green innovation was the focus of a panel discussion involving Jude Chow, Chairman of the Hong Kong Waste Management Association, and Franz Rossler, Consul and Trade Commissioner of the Austrian Trade Commission. Mr Chow revealed that Hong Kong is trying out an innovative technology to process food waste, which is the major constituent of municipal solid waste in Hong Kong. "We are now working with the Hong Kong Productivity Council to test a new technology that turns food waste into oil, high-value animal feed and biogas that can be converted into energy. This innovation has won multiple awards in Geneva, London and Hong Kong. It requires just one-tenth of the capital investment compared to a traditional large-scale food waste treatment plant and the test results look promising," Mr Chow said. Franz Rossler pointed out that an Austrian company that exhibited at last year's Eco Expo Asia has adopted blockchain technology to keep all players of waste systems in the loop in relation to the management of different landfill sites. He added that Austria has been participating as an Eco Expo Asia organising group since 2016, saying the expo helps Austrian companies to promote their business not only in Hong Kong, but also in the Guangdong-Hong Kong-Macao Greater Bay Area. Messe Frankfurt is the world's largest trade fair, congress and event organiser with its own exhibition grounds. With more than 2,400 employees at 30 locations, the company generates annual sales of around EUR 669 million. Thanks to its far-reaching ties with the relevant sectors and to its international sales network, the Group looks after the business interests of its customers effectively. A comprehensive range of services - both onsite and online - ensures that customers worldwide enjoy consistently high quality and flexibility when planning, organising and running their events. The wide range of services includes renting exhibition grounds, trade fair construction and marketing, personnel and food services. With its headquarters in Frankfurt am Main, the company is owned by the City of Frankfurt (60 percent) and the State of Hesse (40 percent).